Reviews recent accomplishments in the field of fluid cracking catalysts (FCC). Discusses the development of more specialized and effective catalysts and processes as well as the modification of current technology to meet future challenges in fuel refining. Written by nearly 50 internationally recognized experts from academia and industry. 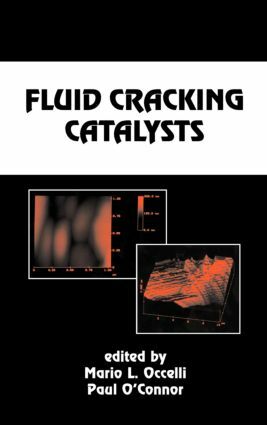 1996 fluid catalytic cracking update; [A1,B]-ZSM-11 FCC additive performance; the effect of silica-to-alumina ratio on the performance of ZSM-5 FCC additives; structure/activity correlations on nickel contaminated fluid cracking catalysts; the effect of the oxidation state of vanadium on the selectivity of fluid catalytic cracking catalysts; accessible catalysts for short contact time; effect of matrix acidity on resid cracking activity of FCC catalysts; high metal tolerance matrix for FCC catalyst; influence of the nature of FCC feed on the production of light olefins by catalytic cracking; recent advances in FCC catalyst evaluations - MAT vs DCR; coking and chemical stripping of FCC catalysts in a MAT reactor; composite molecular sieve comprising MCM-41 with interporous ZSM-5 structures; hydrogen-transfer activity of MCM-41 mesoporous materials in 1-hexene and cyclohexene isomerization reactions; NMR studies of molecular diffusion within zeolites of the type used in FCC preparation; the use of microcalorimetry and porosimetry to investigate the effects of aging on the acidity of fluid cracking catalysts; methods for the characterization of acid sites in FCC catalysts; atomic force imaging of a fluid cracking catalyst (FCC) surface before and after aging; modified USY zeolites for catalysts by acid extraction; origin and control of nox in the FCCU regenerator; effect of stripper conditions on the yield and structure of coke derived from n-hexadecane; new FCC demetallization procedures.